Today Stuart McMillan MSP for Greenock and Inverclyde hosted a meeting between Rebecca Barr, Director of Scottish War Blinded, Richard Baker, Policy Manager for Scottish War Blinded and Royal Blind, and Jim Boyland, a local veteran and Treasurer for the Greenock Branch of Argyle Veterans, to discuss the services Scottish War Blinded offers to Inverclyde veterans. During the summer, Mr McMillan visited Scottish War Blinded’s Hawkhead Centre in Paisley for veterans with sight loss, irrespective of cause, which is an activity hub for men and women of all ages and abilities and is open free of any cost. The charity offers specialist support to assist with improving independence and mobility, and provides one-to-one guidance to aid veterans in regaining or maintaining confidence after their sight loss. Support includes advice on suitable specialist equipment, such as magnifiers; cane training to increase confidence in mobility when out and about, and practical help on making homes safer for someone with sight loss. The activities and classes offered include arts and crafts, woodwork, getting online, cookery, and sports. Despite being open to all Inverclyde-based veterans who are visually impaired, only a handful from the area are members, so Scottish War Blinded is eager for more people locally to join and make use of their services. “As Convenor of the Cross-Party Group on Visual Impairment, I have worked alongside Royal Blind and Scottish War Blinded for a number of years and recognise the invaluable work they do with veterans with sight loss. “Even if you didn’t lose your sight during your time of service, you can still become a member of Scottish War Blinded if you’re now blind or visually impaired and benefit from their assistance. This includes ensuring you receive the benefits you are entitled to, and even providing equipment or home adaptions to help visually impaired veterans live more independently. “If you think you are eligible and would like to become a Scottish War Blinded member, I urge you to contact myself as I want as many Inverclyde veterans as possible to make use of this amazing facility and service. “Scottish War Blinded is seeking to extend its support to an increasing number of veterans, and this year the charity welcomed its 1,000th member. 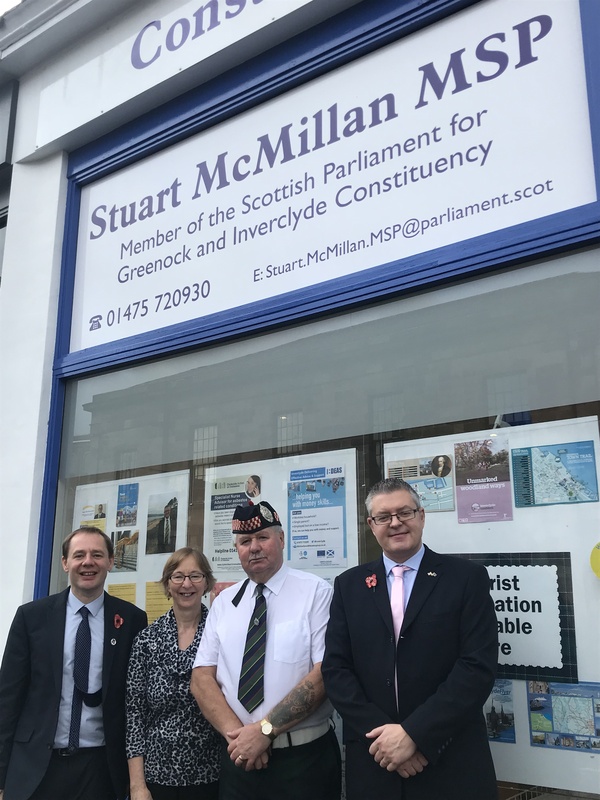 We are keen to welcome more veterans with sight loss in Inverclyde as members of the Scottish War Blinded, and so we are delighted that Stuart McMillan is helping us take this work forward. “We were pleased to welcome Stuart to our Hawkhead Centre in Paisley during the summer, and we have greatly appreciated his support for the work of Scottish War Blinded in his important role as Convener of the Cross Party group on Visual Impairment. “It was great to meet with Rebecca and Richard to learn more about the services Scottish War Blinded offer to veterans with visual impairments. As their centres are based in Paisley, people often assume they aren’t for Inverclyde residents, but they are, and it is crucial blind and visually impaired veterans locally get involved as there are numerous benefits in joining.